electro-music.com :: View topic - FS-1A revival? Posted: Thu Aug 06, 2015 2:39 am Post subject: FS-1A revival? just a quick check whether there are any plans to revive Jürgen Haible's Frequency Shifter. Any chance? Posted: Sun Aug 09, 2015 12:28 am Post subject: Re: FS-1A revival? Posted: Sun Aug 23, 2015 11:37 am Post subject: Re: FS-1A revival? I've built one and have photos and documentation at http://modularsynthesis.com/jhaible/shifter/jhshifter.htm. I'd be interested in helping but I don't need a second frequency shifter but could maybe build one for someone else. It all depends on my availability at the time. My vote is to have Dave build one of the first ones. If anyone can find all that's potentially wrong with it, it'll be him. And I'll buy a large handful of the first ones - all kinds of people are asking for these. i'm dreaming about this one... but it seems to be out of it. 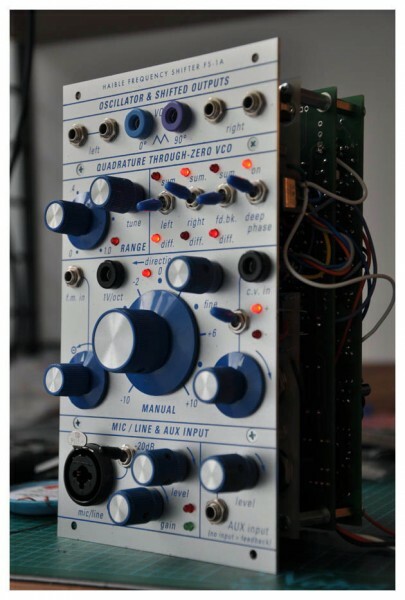 "The FS1a version I made in Buchla format is not in the public domain and there for I can not share any design files."